Chicken Stew with Mushrooms, a delicious one-pot dish that is bursting with the most amazing flavours. 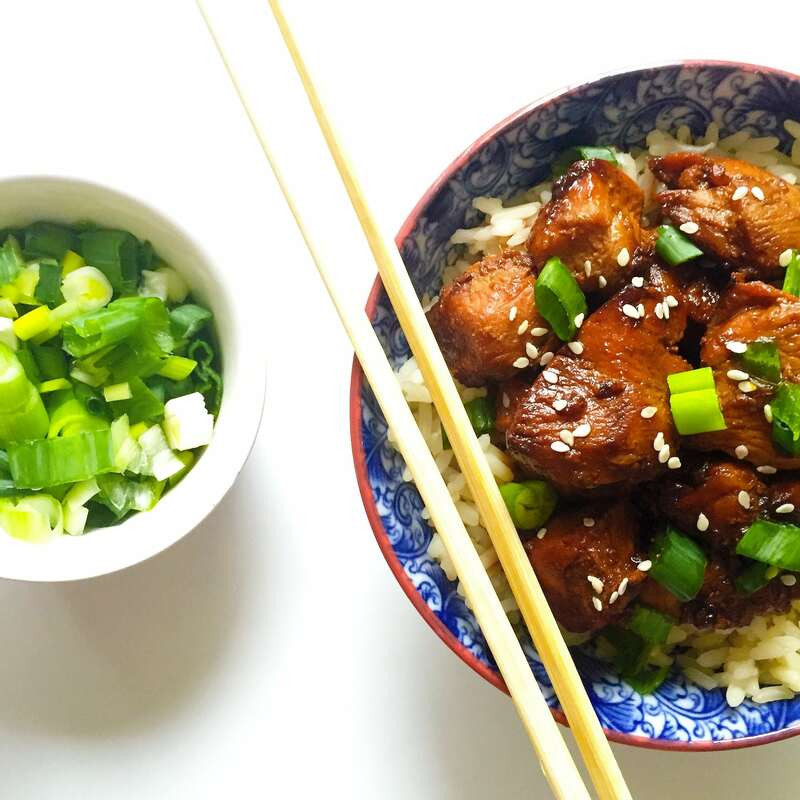 Easy to make, high protein, gluten free, it only requires a few simple ingredients. No oven needed. What a glorious recipe! This chicken stew is by far my favourite chicken dish. And not just because there is little effort put into cooking it, but because it tastes like nothing else in the world. I do not like to use strong herbs or seasoning for this particular food, because I like it to have its natural sweet taste coming from the caramelized onions, mushrooms and chicken. Thyme is always a winner for me, it can safely be used with most dishes, it brings a subtle flavour without stealing the show. Not a fan of alcohol at all, but feel free to add some white wine, if you like, after the onions have been caramelized, but the dish is amazing without it as well. Stews are a great choice for dinners, they are hearty, filling, and great to share. Other favourite stews of mine are the mouth-watering Hearty Oven Beef Stew Recipe [GF], Beef Stew With Sweet Potatoes or the ever so comforting Beef Casserole with Cheesy Gnocchi. 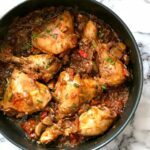 How do you make stove top chicken stew? I prefer using organic chicken, mostly because I do hope that the chicken is actually a better quality and a lot healthier, as the producers state. 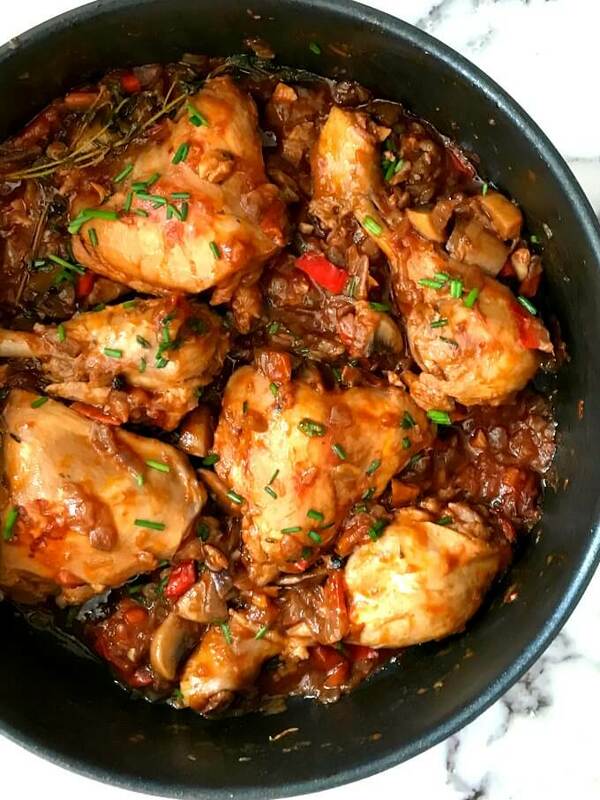 You can replace the chicken thighs and drumsticks with chicken breasts, but I must say in this stew I prefer the former, you get a deeper, richer flavour. Start by sauteeing the onions, the add the mushrooms and peppers, and cook for 5 minutes more, until the veggies soften a bit, then the chicken pieces can be added too together with the bay leaves, peppercorns, paprika and chicken stock (broth). Leave to cook until the chicken is tender, and there is still a bit of liquid left. Add the tomato paste, herbs, and season with salt and pepper. 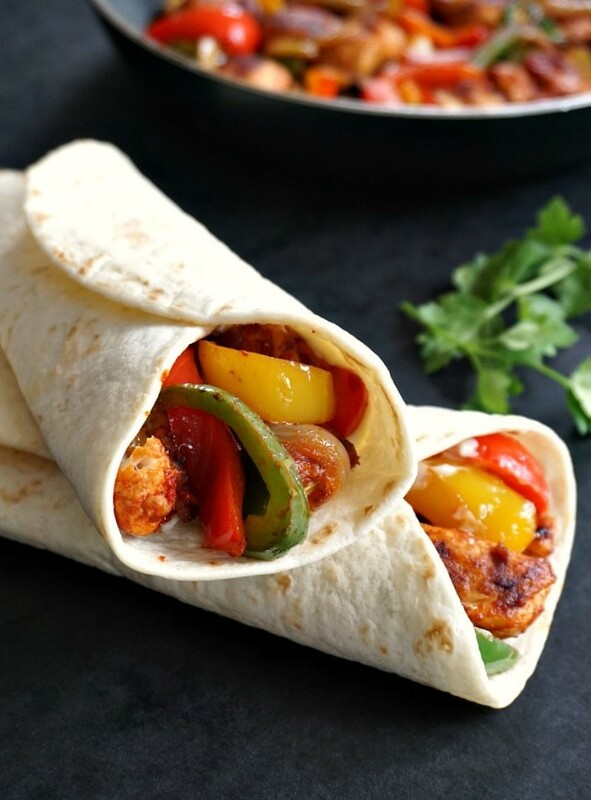 I prefer adding salt at the end, as the chicken and veggies will be releasing their natural flavours, and something there is no need for much salt, you get a super good taste without. Other herbs can be used too, parsley, dill, Herbs de Provence, etc. 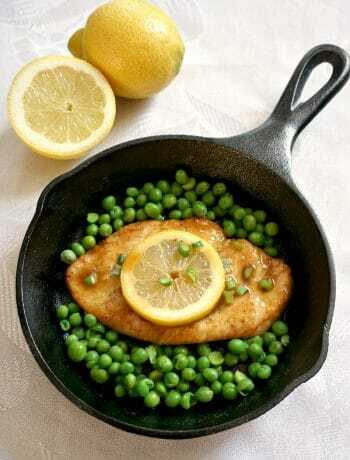 Also, peas, green beans, or carrots would work beautifully in this dish. 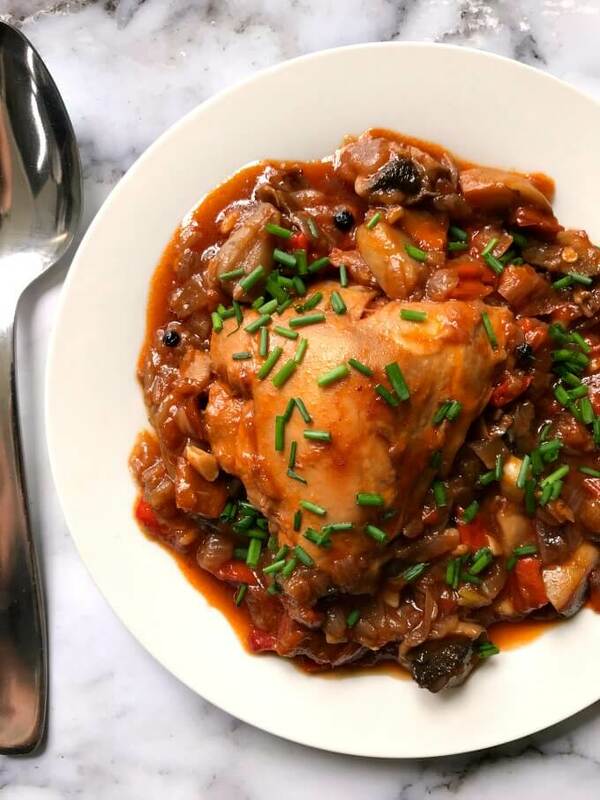 If you’ve liked my ONE-POT CHICKEN STEW WITH MUSHROOMS or any other recipe on the blog then don’t forget to rate the recipe and let me know how you got on in the comments below, I love hearing from you! You can also FOLLOW ME on FACEBOOK, and PINTEREST to see more delicious food and what I’m getting up to. One-Pot Chicken Stew with Mushrooms, a hearty dinner recipe to enjoy with the whole family. Quick and easy to make, no oven required. Peel and chop the onions and fry gently until lightly brown. Chop the red pepper and mushrooms and add them to the pan as well and cook for a further 5 minutes, until the mushrooms soften. 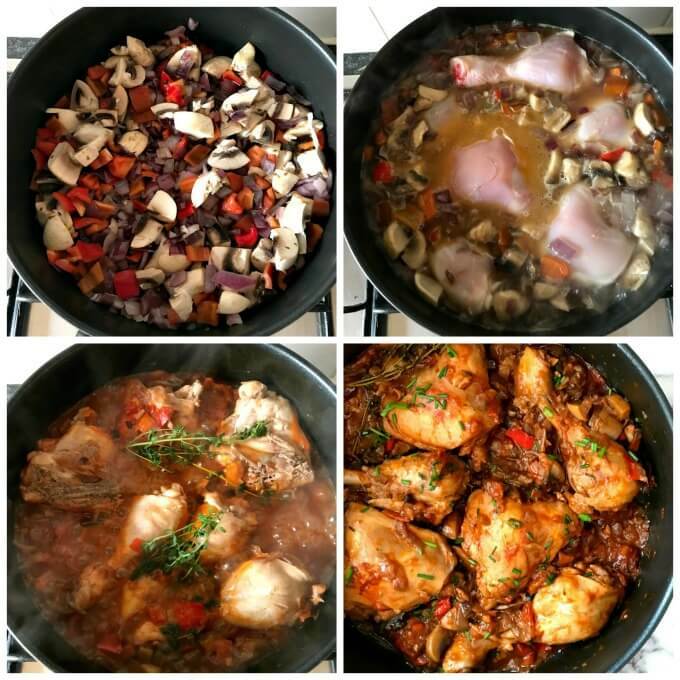 The chicken drumsticks and thighs, bay leaves, paprika and peppercorns can now be added too. Leave to boil until the chicken is cooked through. There should still be liquid left. Add the thyme, tomato paste, salt and pepper, and garnish with chopped chives. Remove from the heat and cover with a lid, leaving the food to rest for at least 5 minutes, so that the full flavours can be released. Love the looks of this chicken and mushroom stew, the colors and flavors are so vibrant. Thank you very much, it’s a hearty and filling meal. I am glad you like it ? Your chicken and mushroom stew looks so vibrant and beautiful. Thank you, I really appreciate your kind comment!